« What A Fun Day! Still Off Water In The Morning! Weather has been hot. Some rain in the area, but it certainly is scattered. Rain at our house 15 minutes away. Not a drop at the shop. We are expecting more of the same. Low to mid 90s for the next five days at least. Right now we are seeing a slight chance for rain by Monday, but still 90s. No generation from at least 8:00 p.m. at night until noon or more frequently, 1:00 p.m. the next day. Lots of good wading time. When they turn it on, it is ripping in a hurry so don’t take your time getting out of the water. Dave and Tom fished with Carolyn this past Monday. Slow start to the day. Lots of fog on the water and once it lifted, about 10:00 a.m., the bite certainly improved. Still not as good as we normally see with no generation. The water was extremely flat that day too. We did managed to put some fish to the next, mainly stripping the tiger tail. Wednesday, Carolyn took Lauretta out for her Mother’s Day present given to her by her daughter, Haley. We even let Haley ride along! Lauretta had fly fished some 20 years ago and must have mentioned that she would like to do it again. It was a done deal. Slow start again with the fog on the water, but we persevered. After the fog lifted and we moved around a little, we found several fish on the ruby 2 midge, but best of all, stripping a red soft hackle. This was the ticket and she really liked catching this way. Fun day and Haley took lots of pictures! Stan had Raymond, from Louisiana out for the morning. Slow start for them too, but they also starting catching on the ruby 2 and the red soft hackle. Today, Carolyn had Bill and Dan, from Florida, on the water. Bill and his wife have fished with us several times. Dan does lots of salt water fishing, but is pretty new to fly fishing for trout. Throws a good line, so no problem…just a little difference in some of the presentations. Tried streamers, but it was a midge day for us. P&P, Ruby 2, and several on the red soft hackle. Good day, especially for Dan. Stan was on the water with Brandon, from Arkansas. P&P, Ruby 2 and JQ streamer were their patterns for the day. 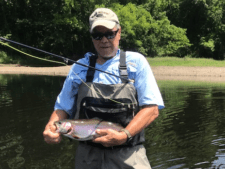 This entry was posted on Thursday, June 14th, 2018 at 4:51 pm	and is filed under Fishing Reports. You can follow any responses to this entry through the RSS 2.0 feed. You can leave a response, or trackback from your own site.